update_excuses: show why a package "does not have binaries"
After fixing FTBFS bugs on the newly imported orthanc-digicom and orthanc-webview packages, I got a message saying it was stuck and directing me to update_excuses. Looking into it I saw a "has no binaries on any arch" message. The project page for those packages did show a note "Note: Some binary packages for this source are not yet published in the repository." as well as a "Pending publication" besides each arch on the "Builds" section. update_excuses could be improved to show why the package has no binaries - in this case, publication was pending (furthermore, but I'm not sure update_excuses could fetch this information somehow, that was because they were new packages and thus were stuck in the NEW queue waiting to be approved by an archive admin). 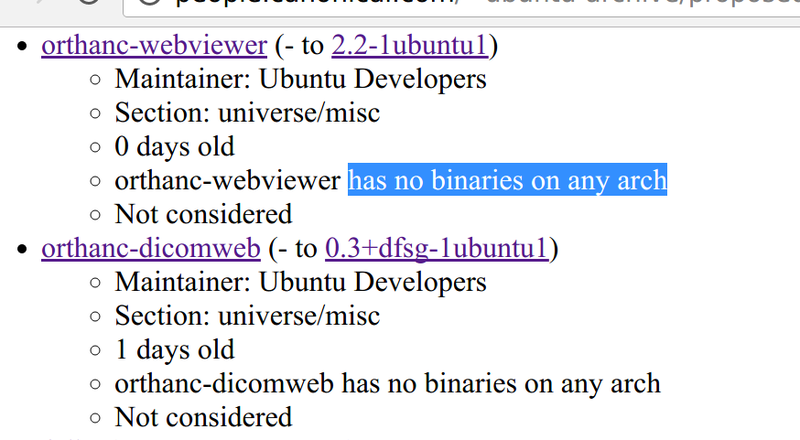 Attached screenshot of the "has no binaries on any arch" from update_excuses. Attached screenshot of the orthanc-webviewer containing "Note: Some binary packages for this source are not yet published in the repository." and "Pending publication" messages. One improvement in this case would be automatically listing bugs with "ftbfs" tag on update_excuses. This would help assessing the current state of the package quickly and would also help recording observations in the bug, for example when packaging in Debian stopped providing binary packages for a given set of architectures and the package is waiting for removals in Ubuntu. Looking at britney's code it seems a script is needed to collect the ftbfs bugs from Launchpad and britney could load them like the "block-proposed" bugs but existing "ftbfs" bugs should not block migration just provide explanation for packages blocked due to missing binaries. I'm a bit worried about maintaining extra code in (makes rebasing harder) and around (needs to be maintained) proposed-migration. 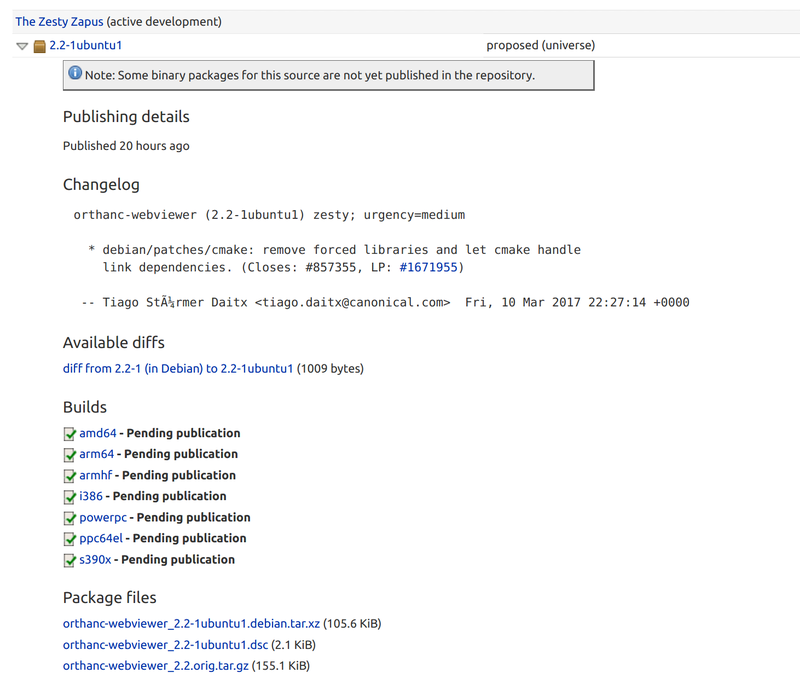 I think most Ubuntu developers ought to be able to find bugs against packages without having them listed on update_excuses.html. FTBFS is just one reason why a package might not migrate so I'm also worried about being vulnerable to mission creep and turning update_excuses into a one-stop "what's wrong here?" shop. What do you think? Is this worth it? Or can we say that we expect developers to be able to find out what's wrong on their own? I think showing "ftbfs" bugs could be beneficial for Debian as well thus it does not have to be part of the delta. Debian's script would collect the FTBFS buts from Debian's BTS, that is not a huge difference IMO. I agree that Ubuntu devs should be able to find bugs of "foo" when "foo" is blocked, but sometimes (many times as I saw) the bug is not in "foo" but in a transitive dependency and the build/test log is not always verbose enough to figure out from the first glance what goes wrong. Avoiding the mission creep is a valid concern, but IMO update_excuses is actually one of the very important stops where people spend time to look for blocker issues and providing them a good set of pointers helps eliminating duplicate work. Having the link to the bug helps greatly in following the issues without having to parse the build log again and again. What I'm aiming at is having fewer packages stuck in migration but with more helpful information available for unblocking them. > more helpful information available for unblocking them. simple PTS-type thing to keep our parts separate from upstream p-m.
Having PTS and tracker in Debian helps greatly in getting an overview per source package, but are not, and I think can't really be used for visualizing queues, like the migration queue. update_excuses.yaml can already be useful for example I used it to create re-run links for failed autopkgtests due to missing versioned dependencies , but making such features globally available would be better than running private helper scripts. > visualizing queues, like the migration queue. > better than running private helper scripts. I'm not suggesting a private script.